1959 Jake Mullet began building custom kitchen cabinetry in the heart of Ohio’s Amish Furniture Country. With no shop in which to work and very limited tools, all of this was done right in peoples’ homes. However, his dream was to someday have his own shop with modern tools (including sharp saw blades) rather than needing to move from job to job for his work. 1965 That dream began to unfold in June of 1965. Jake was offered a job in a small custom cabinet shop owned by Freeman Hostetler, at the rate of $1.75 per hour. The business was located in a building rented from Harry Weaver, another Fryburg resident. Jake accepted the position and a special family tradition was begun. 1966 Many changes still awaited Jake in his cabinet making career. 1974 Unfortunately, a paint room fire destroyed the new facility. It was soon after this disaster that Freeman Hostetler offered Jake the opportunity of buying the business. Jake’s dream of owning his own custom cabinet shop had finally become a reality. 1975 Jake and Dean together bought Hostetler Cabinet in 1975. A year later, in 1976, Jake’s younger son, Dennis, joined the business (now named Mullet Cabinet) as a partner. 1981 Over the next 25 years, Mullet Cabinet grew rapidly into the custom cabinet manufacturer it is today. Strong emphasis was placed on using cutting-edge technology in the shop, while at the same time offering innovative design, high quality custom product lines, and outstanding service to their customers – all at fair prices and while maintaining the highest levels of integrity. 1999 Seeing a need in the market, a new line of frameless, commercial cabinets is created under the name Eurocase, Archictectural Cabinets and Millwork. Eurocase supplies quality commercial cabinets based on the 32 mm system to the Medical, Educational and Commercial Business markets. 2001 Mullet Cabinet begins to expand by selling to kitchen dealers east of the Mississippi. 2002 The partnership between father and sons continued under these business principles until January of 2002, when Dean became the sole owner of Mullet Cabinet. 2005 Continuing the family tradition, Dean’s three sons, Vince, Jordan, and Nick are actively involved in running the company. Though, not actively involved in the day to day business, Jake still has an office at Mullet Cabinet and comes in everyday. 2007 Mullet Cabinet launches a new line of cabinetry called Levant Kitchen Furniture, a framed product featuring inset and full overlay doors, custom colors, and a four week lead time. 2008 A new Custom Color Studio is added, allowing color specialist, Lamar Troyer, additional room to create his collection finishes. 2009 Starting in the fall of ’08, Mullet began a complete redesign of the showroom. Celebrating the completion of the new Design Center with a six day Grand Opening celebration featuring cooking demo’s, give-aways and great food in May of ’09. The new Design Center displays five kitchens, a library, wet bar, laundry room, lockers, creative office spaces, fine furniture, and a variety of bathroom vanities. 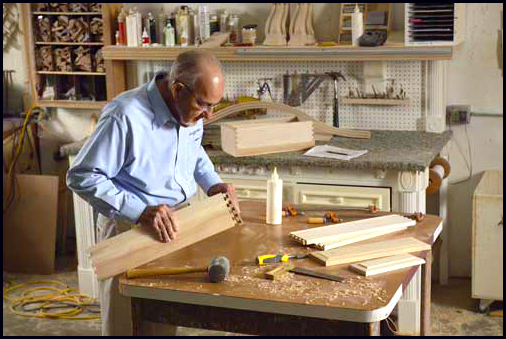 2011 Levant Kitchen Furniture was chosen as the kitchen cabinetry for PBS’s This Old House Bedford Project. After a successful six month test, a new frameless cabinet box was launched for Levant Kitchen Furniture. The new cabinet box is available with all of Levant’s fabulous finishes in four weeks. In the factory, new equipment was added including a new CNC and a flat line oven system. The state of the art Finish department was expanded by 60% to allow for future growth. Today Many more changes have been made to Mullet Cabinet. Significant among these were the approximately 12 additions made to the original building between 1976 and 1988. Innumerable other improvements were made to materials, methods and equipment and yes, Jake also got his sharp saw blades! Mullet Cabinet includes a facility of approximately 75,000 square feet with over 100 employees – some of which have been with the Mullet family for many years. But despite these changes and growth, the quality, craftsmanship, and integrity that Jake Mullet started in 1959 are still a trademark of Mullet Cabinet today.